Once I saw Ellen's crochet pretties, I really wanted to make them too! I found the pattern via her pin and gave it a try! What amazed me the most about this motif, was the fact that the pattern was originally printed in a book of the year 1893!! I also made a board on pinterest about pattern instructions I'll collect, for my future projects!! that is so cool! I love them and I love the fact the pattern is so old!!! Wow, yours look great in pastels! Love them, I loved that the pattern is so old too! It was really easy to follow! Cute and simple. I love it. I might have to break out my old crochet needle. Thanks! So beautiful! I wish I knew how to crochet. I would LOVE for you to stop over and link this up in our Crafty Saturday Showcase! It runs from Sat-Thur. Then we pick the top post to feature on Friday. We also have a linky for ETSY and Business Crafty items! Thank you for sharing these at Freedom Fridays:) Have a marvelous weekend! Very pretty! 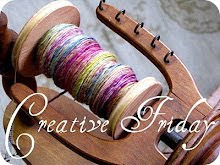 Thank you for joining Fibers on Friday! I love these coasters - especially that they came from the 1800's! I have several vintage patterns I've found in thrift stores. Sometimes the language can be difficult, but once you get past that they're terrific! I like your blog. The way it's laid out is easy to follow. I also like that you include the places where you post. Since I crochet I'm always happy to meet a fellow crocheter! Nicely done. They are really sweet! Something to add to my new-found crocheting hobby. Thanks for the link. I have been searching the web for the pattern for these coasters and the link that everyone references no longer has the pattern listed. Would you be willing to share this free pattern with me? I love the pattern and am really wanting to make coasters! I keep looking for this pattern without luck do you have it?